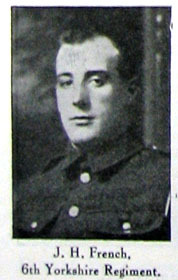 Private John Henry FRENCH. 11015. 6th Battalion Yorkshire Regiment. Husband of Mary Ann Gibbon (formerly French), of 19, David Terrace, Coronation, Eldon Lane, Bishop Auckland, Co. Durham. Killed 7 August 1915. Aged 28.